The James Kreppner Award program supports legal research relevant to Canadian Blood Services. Research priorities for the James Kreppner Award include the legal and regulatory aspects of (a) donation, collection, storage, and use of blood, blood products, and hematopoietic stem cells; and (b) organ and tissue donation and transplantation. The 2016 James Kreppner Award will support one project with up to $50,000 for a period of one year. This year’s competition closes Nov. 30, 2016. When I applied for the James Kreppner Fellowship in 2014, I had recently started working as an academic in health law research after leaving a career in private practice. 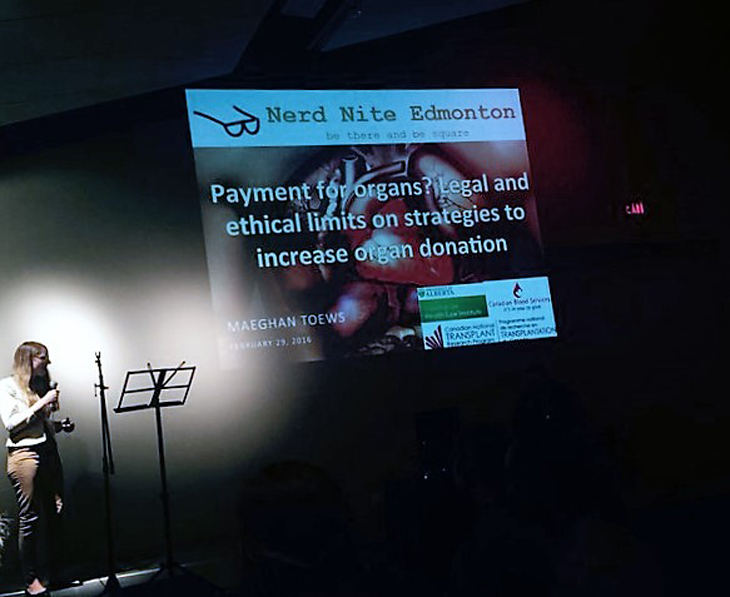 I had been following legal developments in the organ donation landscape of my home province of Alberta and became interested in the question of how law could be used to shape donation practice and policy. With this in mind, I applied for the James Kreppner Fellowship, and was ecstatic to learn that my application was successful. What I didn’t anticipate at the time, however, was just how influential this fellowship would prove to be in launching me forward in my early academic career. Receiving the fellowship has been enormously helpful in establishing myself as a Canadian health law scholar. Having the financial freedom to set my own research agenda and pursue topics that I find interesting and exciting is particularly rewarding and beneficial at this early stage of my career. I can ask questions, pursue tangents, meet people from a wide range of disciplines, and truly explore the donation and transplantation landscape. I have also had access to the wealth of experience, insight, and mentorship of the Canadian Blood Services’ leadership and community. After commencing the fellowship, I was immediately welcomed into the fold through Canadian Blood Services’ Donation Legal Research and Health Policy Working Group, where I have received continuous support and feedback on my work, as well as the opportunity to connect and collaborate with other legal scholars working in the field. Although the fellowship has a legal focus, it has provided many opportunities to engage with the broader donation and transplantation communities. The fellowship has provided the necessary support to enable me to participate and present at several key meetings held by Canadian Blood Services, the Canadian National Transplant Research Program, the Canadian Society of Transplantation, and the Canadian Critical Care Society. In addition, I have forged international connections and pursued opportunities to share my research abroad at the Ethical, Legal and Psychosocial Aspects of Organ Transplantation (ELPAT) Congress in Rome, and the American Society of Transplantation’s Cutting Edge of Transplantation meeting in Phoenix. These opportunities have been valuable not only in terms of building a strong academic record (in some pretty fun locations!) but, more importantly, in terms of building relationships with colleagues and finding a place for legal scholarship within the donation and transplantation communities. What I’ve learned from these experiences is that there is a genuine interest in legal research and an appreciation for the work being done by legal scholars in this area. There is also no shortage of work to be done in this field, as donation and transplantation technology and policy are constantly evolving and raising new and interesting legal questions to explore. There has also been tremendous value in connecting with members of this community to learn about new developments in donation and transplantation, understand some of the challenges being faced, and gain insight into how law and policy are operationalized in practice. These perspectives have truly enriched my work, which could not have been accomplished in isolation. Another unique benefit of working under this award is the opportunity to explore the relevance of legal research beyond academia and toward policy and practice change. For example, I was recently invited to participate in a policy workshop held by Canadian Blood Services and the Canadian National Transplant Research Program to develop recommendations to improve donor identification and referral. Emerging Research Methods and the Consent Challenge, a workshop held in Banff, Alberta in 2016. 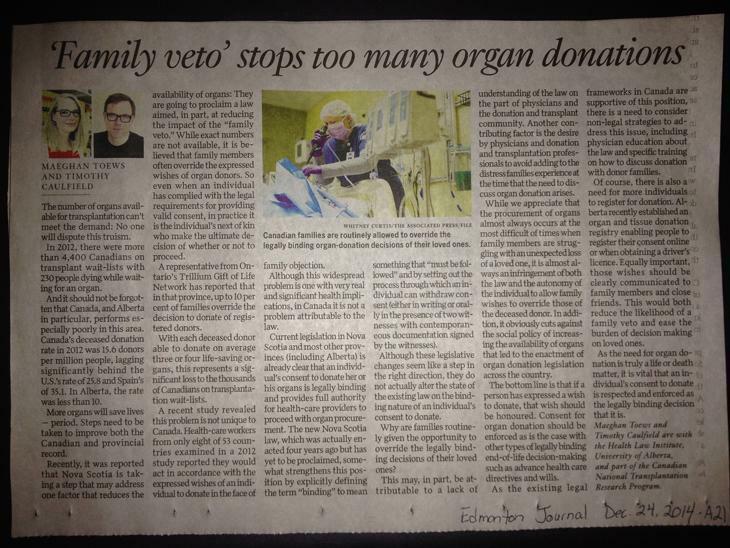 Similarly, I recently had an opportunity to lead a research ethics workshop session devoted to identifying barriers and ways to improve organ donation intervention research in Canada. 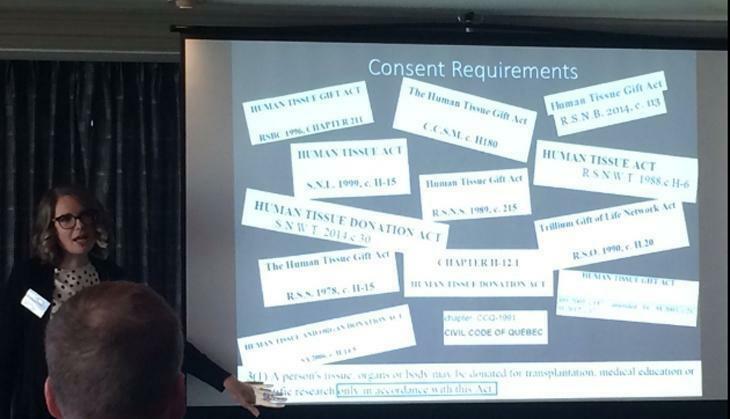 I have also had incredible support from Canadian Blood Services on my project examining the legal status of consent for deceased donation in situations where a potential donor’s family objects to donation, and we are in the process of strategizing how to move this issue forward into practice and policy change. In short, this fellowship has been an incredibly rewarding experience that has allowed me to integrate into a fantastic community of clinicians, researchers, and professionals from a wide range of disciplines and backgrounds. And in the process, I’ve pursued interesting research, shared my work all over the country and abroad, and built relationships and opportunities for collaboration that will continue well beyond the fellowship as I embark on the next phase of my career. Find out more about the James Kreppner Award program. This year’s competition closes Nov. 30, 2016.